U.S.S. 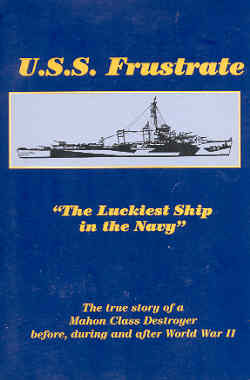 Frustrate: "The Luckiest Ship in the Navy"
HOME > Books > Ship Histories > U.S.S. Frustrate: "The Luckiest Ship in the Navy"
The destroyer U.S.S. Flusser (DD-368) got the nickname of U.S.S. Frustrate from a February 1943 newspaper article with the subtitle "Fighting Ship Vainly Seeking Action in the Pacific." Flusser had been stationed at Pearl Harbor when Japan attacked on December 7, 1941, but the destroyer had been escorting the carrier Lexington (CV-2) away from base so did not encounter the enemy. Not until September 1944 did Flusser directly engage the Japanese in battle when the ship was hit by shrapnel from nearby exploding shells that had been launched from shore batteries on Wotje Island. In November and December 1944, the action really got hot during several encounters with kamikaze aircraft in the Philippines. E. B. Dennis served aboard Flusser as a sonarman from January 1942 until April 1945, when he had to leave due to three fractured vertebrae. He published a previous book about Flusser (The Destroyer U.S.S. Flusser DD368, 1989). U.S.S. Frustrate, published in 1998, generally expands on the accounts included in his earlier work, but this book does not include a few interesting items from the prior work such as a June 1944 newspaper article about the continuing frustrations of U.S.S. Frustrate. Both books suffer greatly from a lack of personal stories despite the author's involvement in the U.S.S. Flusser Association. This history quickly turns into a dry recitation of ship movements most probably from official logs. Although the author's emotions and opinions during the war do not come out in the narrative, he clearly has a sense of humor. The end of each of the 46 chapters has a joke, quite unrelated to the book's main contents. He sometimes uses inflammatory terms for Japanese kamikaze such as "suicide nuts," "crazy Kamikazes," and "nuts who like to die for the Emperor." Flusser's closest encounter with a kamikaze came on November 18, 1944. A suicide plane passed just over the bridge, and its bomb exploded along the port side amidships. "Pieces of the aircraft rained all over the ship like hail. Almost everyone on the deck picked up a piece of the airplane" (p. 112). During the Battle of Ormoc Bay on December 7, 1944, Flusser faced continuous kamikaze attacks. The destroyer Mahan (DD-364) and the high speed transport Ward (APD-16) were sunk by kamikaze hits. In mid-afternoon, a kamikaze plane crossed Flusser's bow and slammed into the bridge of the destroyer Lamson (DD-367). The crash killed 21 men, but Flusser rescued many survivors from the water as kamikaze planes continued their attacks. Although Flusser may have had the somewhat negative nickname of Frustrate, the crew considered her to be a lucky ship to have gone through the entire war and survived so many life-threatening situations.